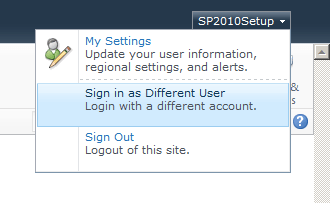 I’ve been exploring SharePoint 2013 in recent days and noticed that the ‘Sign in as Different User’ option or action from the welcome control (user menu) seems to have been removed or forgotten from the user interface in this build. For someone who works with SharePoint like I do, any kind of administration, developing or testing that requires you to sign in as another you will now become convoluted from the previous version and is somewhat frustrating and annoying. Others such as Nick Grattan have discussed this issue and possible workarounds. It will be interesting to see what others do and as to whether or not the option gets added back by Microsoft in a future update.